I had the saddest and sweetest unexpected conversation with Luke a few weeks ago. One morning at the breakfast table he said to me, very somberly, "Mommy, I'm sad." "Because," he sighed. "I only have one grandma." I have no idea how this concept came to him, the concept that most kids have two (or more) grandmas. It was all I could do to hold back tears as I replied, "Yes, I'm sad about that too." "Because Grandma DeJong was my mommy." "And now she lives in heaven with Jesus?" "Yes." By this point, I was definitely crying. But I managed to say, "I know you only have one grandma, but she is a really great grandma. So we should be thankful for her." "Yeah. Let's go to her house today!" "Sorry, we can't go today. But just think; you have other women that are just like grandmas. Like Oma Chris and Grandma Becky. And you have four great-grandmas. All these women love you very much. So we can be thankful for them." We continued to discuss all of these women and how exactly they are all related to Luke, etc. It made me very thankful and put a smile on my face, even as the tears were still sliding down my cheeks. I asked myself this week how my mom would have embraced Mother's Day, were she in my place. I think I know. How many times did she instruct me to look beyond my (seemingly monstrous) sufferings and to focus instead on God's blessings and provision? I honor my mom today for the remarkable woman she was. At least once a week I find myself asking, How did she do this? I wish I could ask her. But I also thank God for the women that I have left on this earth. You have blessed us more than I can say. 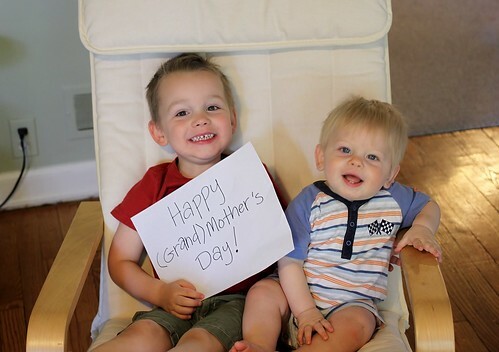 Happy (Grand)Mother's Day to you!